Artists and Art – Picasso, That’s Who! 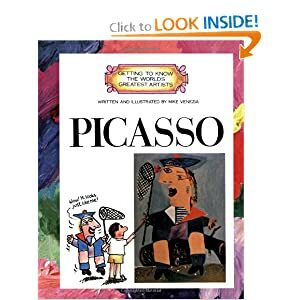 My friend Kristen at Teaching Stars got a chance to review the CD Picasso, That’s Who! (and so can you!) and upon reading the review, I knew I wanted that CD for our homeschool. Luckily, Hope Harris is incredibly generous and offered me a CD to review as well! I was ecstatic and eagerly awaited the CD’s arrival. I was not disappointed. You can hear two of the songs here to give you an idea. Each song is done in a different style and each of those styles reflects the artist about which Harris is singing. For example, the song about Picasso has a Spanish flair, while the Grandma Moses song has a folk song air. The CD includes artists the kids and I were not familiar with (Hockney, Calder, Romare Bearden) as well as ones for which we have already done lessons, either at home or at Classical Conversations (Jackson Pollock, Pablo Picasso, Georgia O’Keeffe, Paul Klee -1, 2, 3, Matisse, Monet, Grandma Moses). You can get the CD from Hope Harris’ site or as an MP3 download at Amazon. Kristen has been doing artist studies (Adventures in Art) over at her blog, going in order through the CD. We were finishing up a row of Ferdinand when I heard about the CD so our first project involved Picasso, since he is from Spain. 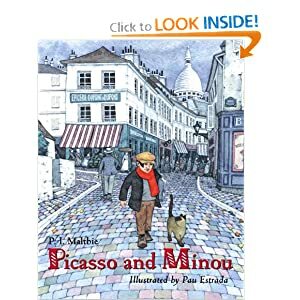 It fit with Ferdinand and we were even able to see Picasso originals at a nearby art museum:) Kristen has great Picasso resources listed on her post. 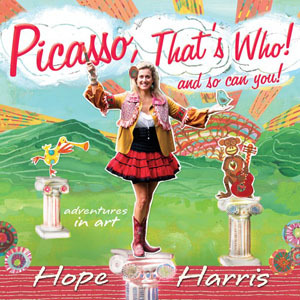 We obviously listened to the Picasso song on Hope Harris’ CD. You can hear it here. Bear was very inspired by the blue period and looking especially at Old Guitarist as inspiration. We observed the different tints and shades of blue and experimented a bit with adding black and white to blue paint to see the effects. 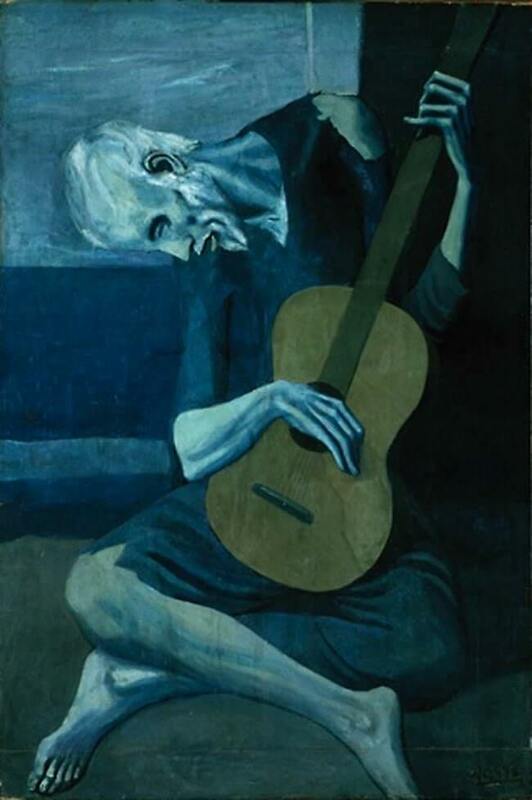 She came up with her own idea for a blue period painting – a guitar. I requested that she try to use more than one tint of blue. The finished product. I think it meets the criteria. Meanwhile, J-jo worked on his own blue period painting. Then he proceeded to ask for pink paint for a rose period painting! I highly recommend the CD Picasso, That’s Who! (And so can you!). Again, you can get the CD from Hope Harris’ site or as an MP3 download at Amazon. It’s sure to add an element of fun to art appreciation in your house. We’ll be listening to track number 3 next and looking at David Hockney paintings, to try to figure out, “who made the splash in David Hockney’s painting?” Do you know? I always love your art studies! Wonderful! How fun! Love Bear’s guitar. You are right – she is very serious about her art. We love Hope Harris. She’s a local musician and it’s so funny you made this post, as I just signed my girls up to do a music/art camp with her at our local art museum. We are soooo looking forward! Reply to Alycia in Va.